Make your bathroom look like new with this chic, useful piece from Delta. Redo the look of your bathroom with this beautiful dual-control faucet. Add more beauty to your bathroom with this item's easy-to-install, deck mounted design. This faucet is WaterSense certified, using less water to work so you have a smaller utility bill. This piece from Delta has an all-around look that works well with many bathroom styles. Finish up your bathroom remodel with this beautiful single-control faucet. Its deck mounted design makes it easy to set up and looks great with many sink types. Save water with this WaterSense certified faucet - designed to help keep you and the environment clean with less water use. Add a modern look to any bathroom with this piece from Delta. Finish up your bathroom remodel with this beautiful single-control faucet. Its deck mounted design makes it easy to set up and looks great with many sink types. This faucet is WaterSense certified so you use less water to get clean and help the environment. Linden Centerset (4-inch) 2-Handle Mid Arc Bathroom Faucet in Chrome with Lever Handles Make your bathroom look like new with this chic, useful piece from Delta. Redo the look of your bathroom with this beautiful dual-control faucet. Add more beauty to your bathroom with this item's easy-to-install, deck mounted design. This faucet is WaterSense certified, using less water to work so you have a smaller utility bill. 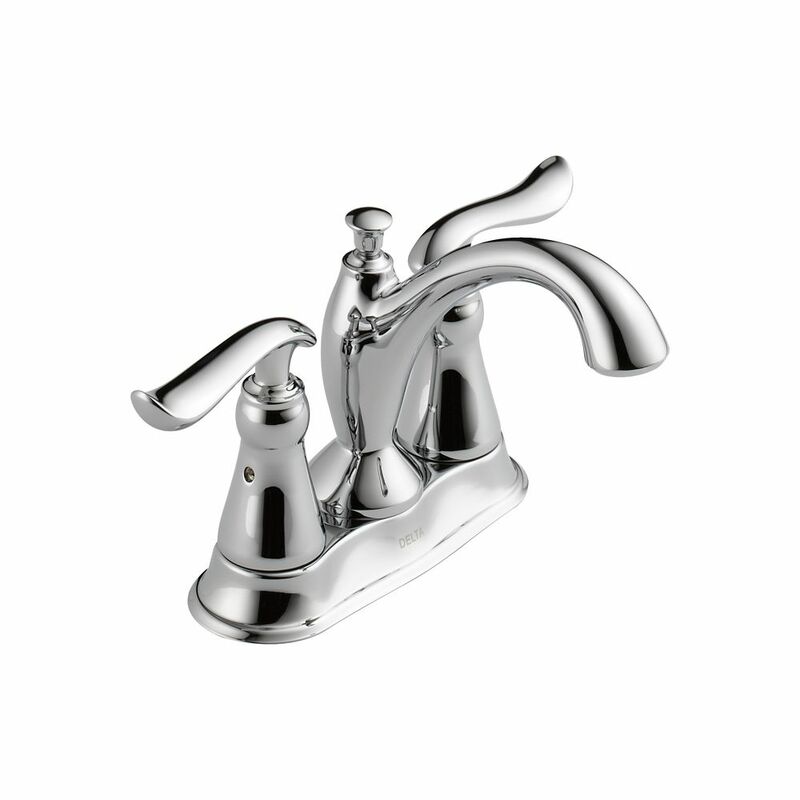 Linden Centerset (4-inch) 2-Handle Mid Arc Bathroom Faucet in Chrome with Lever Handles is rated 4.7 out of 5 by 79. Rated 5 out of 5 by Jay from Very good Faucet o overall. Solid mechanics and very sharp looking . Very good Faucet o overall. Solid mechanics and very sharp looking . Rated 4 out of 5 by retired from I purchased this on-line since the product was not available... I purchased this on-line since the product was not available at the local Home Depot - in the STAINLESS finish. The design is very pleasing, unfortunately, the finish which is depicted as a soft finely brushed finish is actually a bright medium brushed finish, not at all like the photo. Rated 5 out of 5 by updated from This newer color is really a nice updated transition from... This newer color is really a nice updated transition from the polished brass of the 80's and 90's. We used it in a bathroom that still had that older finish on the shower doors. We found lighting to match from Seagull brand in what they call warm brass. Rated 5 out of 5 by Crystal from Beautiful! It was a Great choice!... Beautiful! It was a Great choice! Rated 5 out of 5 by Barbara from This is a very pretty faucet and my plumber told... This is a very pretty faucet and my plumber told me that chrome is one of the most durable finishes, so I'm expecting years of good service from my new faucet! Rated 5 out of 5 by Gustavo from Excellent Product ! this Delta Faucet is just beautiful at the look,even the Handyman was impress... Excellent Product ! this Delta Faucet is just beautiful at the look,even the Handyman was impressed when he opened the box, it looks great and it looks strong. it arrived much earlier than I was expecting . its worth the money ! it meet my expectations completely . thanks Home Depot, great Product ! Rated 5 out of 5 by Dana from This sink looks beautiful and comes with all the parts... This sink looks beautiful and comes with all the parts needed to install at a good price! !